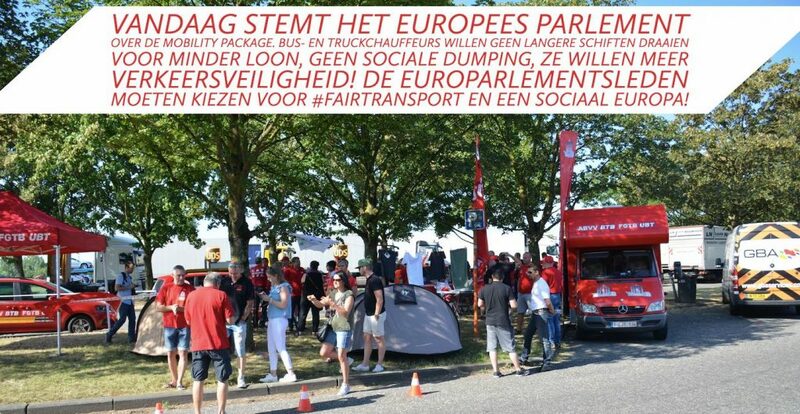 Belgian transport workers’ union BTB-UBT displayed its creative approach to campaigning with a simultaneous action in Brussels and Strasbourg. The actions coincided with the important vote in the European Parliament on the EU Mobility Package. The eye-catching theme of the action was “Camping Europe”. On the site of a rest area of the E40 highway, transport workers set up camp to protest against shocking regulatory proposals that would have allowed truck drivers to take even their longer rest in the cramped cabins of their vehicles.